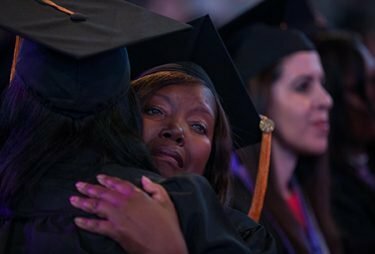 Pastor Darryl L. Lee was powering toward an online sociology degree at Grand Canyon University when he was derailed by the unimaginable. Nine members of a historically black church in Charleston, S.C., were killed on June 17, 2015, by a hate-spewing gunman. Lee, pastor of neighboring Zion AME Church, knew eight of the victims. The pain in his heart overpowered his ability to concentrate. Grieving parishioners suddenly took precedence over schoolwork. “It was difficult to go on with my studies. I struggled to stay on track because I did not want the shooting to stop me from graduating,” he said. The father of six credits the understanding of a GCU professor and prayer for helping him overcome a Mt. Everest-size academic hurdle. Lee no longer remembers the class he was taking or the name of the professor. He only remembers GCU’s “support and understanding,” two forces that continued to help Lee during the distraction of the trial. On Jan. 10, Dylann Roof was sentenced to death for gunning down the worshippers at their weekly Bible study. After the massacre, Lee faced two other unexpected roadblocks while working toward his Bachelor of Science in Sociology. A fire forced his family to evacuate its home for weeks, and he spent three weeks at his sister’s side in a hospital intensive care unit. “Again the professors were understanding, and my faith kept me going,” he said. Lee, who visited GCU for the first time for Friday’s online commencement, enrolled in the College of Humanities and Social Sciences in November 2013. His reasons were twofold: to increase his professional marketability and set an example for his children. “I felt that if I expected my children to get an education, I should set the example,” Lee said. Overcoming three sucker punches – the Charleston shooting deaths, house fire and sister’s illness – also served as examples to his children. Sherri Frey (right) and her daughter Brandi Scott, both got their degrees, but for Sherri it was quite a journey. 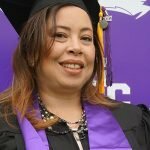 As Sherri Frey lay in a hospital bed, ravaged by the effects of a life-threatening autoimmune disease, she didn’t lose sight of the Nursing degree she was determined to earn from GCU. 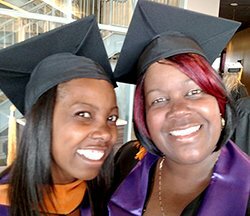 She had two things going for her: She wanted to graduate at the same time as her daughter, Brandi Scott, who was enrolled in the master’s nursing program. And her student services adviser, Jesse Kloos, kept calling her and urging her to not give up. “He kept me motivated and said I was in his prayers,” Frey said Friday morning as she and her daughter prepared to receive their diplomas together. Frey and her daughter work together, too — at Desert Valley Hospital in Victorville, Calif. They said that all of the 35 nurses at the hospital have gotten degrees from GCU. “It’s so user-friendly,” Frey said. In more ways than just academics. Families often help online students stay on course, but not because the learners need to be pushed. Just having children is motivation enough. 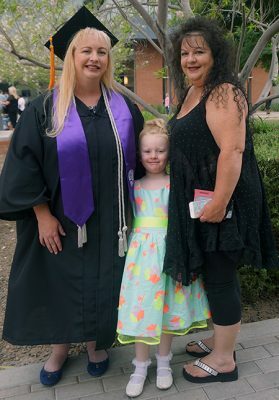 Andrea Snyder of Temecula, Calif., wore a mortarboard that read, “It always seems impossible until it’s done,” and one look at her family tree shows why she feels that way. Her kids are ages 15, 13, 5 and 2. But Snyder got her B.S. in Nursing because she wanted to be the first person in her family to get a degree. What was the hardest part? “Writing papers and raising a family,” she said. That’s a pretty tough tandem to overcome. 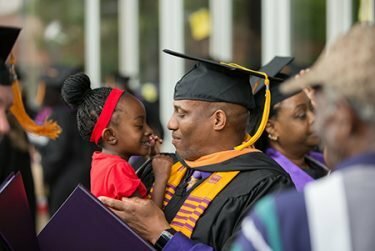 Kirk Winn got his bachelor’s in Health Care Administration to set an example for his two daughters, ages 12 and 14, but also credits his family’s support for his ability to get it done. But his motivation also came from his workplace, Kaiser Permanente in San Diego. The certified orthopedic technologist wants to show he can do more. Sandra Wong often felt tugged in competing directions by her full-time nursing job, two children and GCU classwork. Instead of panicking, the San Ramon, Calif., nurse dedicated to helping women with post-partum depression placed herself in timeout. 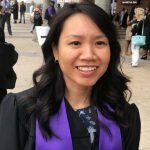 “I found that quiet time alone, time to pray and think kept me going,” said Wong, who received her bachelor’s in Nursing. Jacquelyn Torres never looked far for the motivation to study, stay on schedule and earn her nursing degree. “It was tough at times to juggle work, school and family, but my kids kept me going,” said the Buena Park, Calif., mother of three, ages 7, 5 and 2. 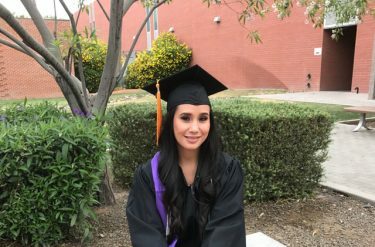 In turn, Torres, a nurse at Los Angeles County Hospital, believes her 14-month quest for a Bachelor of Arts in Nursing eventually will help her children. Bernice Reed posed for numerous photos and her 19-year-old daughter, Katarina, snapped away with her cellphone. For Reed, commencement was an emotional day. Reed’s enrollment at GCU got her a bachelor’s degree in Health Administration. She is also the first in her family to graduate. But Reed doesn’t plan on stopping there. “I’m going for my master’s,” she said. 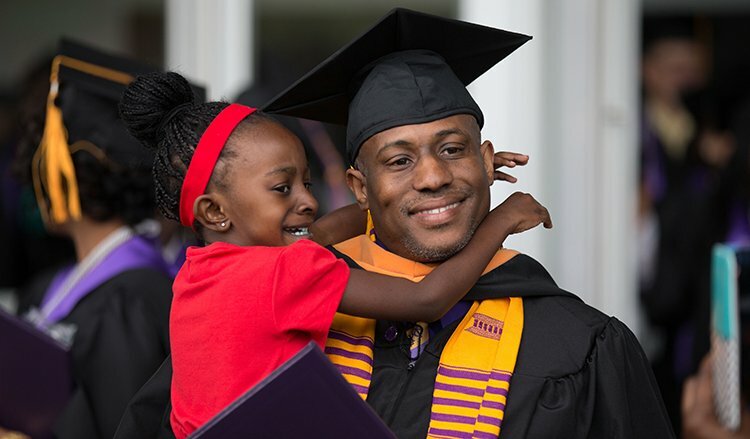 Welton Wiley of Monroe, La., also said his family was his motivation, but he’s at the other end of the kid spectrum — the pastor of St. Luke Baptist Church already has put three kids through college. 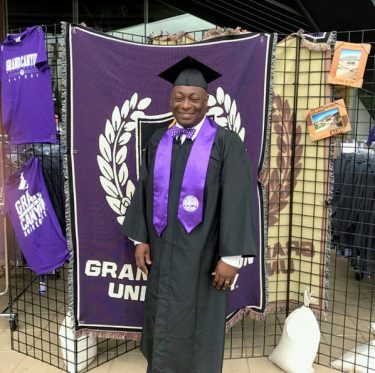 The Navy veteran has been a licensed counselor for 26 years but still wanted to get his master’s in Addiction Counseling, and he said GCU’s discount for veterans helped him make it happen. He visited the campus for the first time this week. His first impression? “How beautiful it is,” he said. Lisa Kakert’s passion for nursing brought her back to school and she did it all for her 4-year-old daughter, Autumn. Lisa Kakert (left) with her 4-year-old daughter Autumn and mother, Kathleen Rochin. Kakert, a 10-year charge nurse in an orthopedic unit in Flagstaff, was born with a severe case of scoliosis. After many doctor visits, treatment and surgery, Kakert felt a calling to give back. Some people get their degree for their mother instead. Latonya Subject, an assistant principal clerk at Vincent Middle School in Beaumont, Texas was excited to be on campus, along with her mom, Rebecca Maldrough. “It’s been a long time coming, and I am so proud of my accomplishment and I plan on going further and further,” said Subject. The communications major said she wants to now take her experience into the classroom by providing a communications elective at the Texas school campus. For Subject, looking forward to the finish line was the motivating factor. When Jasmine Washington of Mesa struggled with a reading assignment or feeling isolated, she turned to her digital peers for help. “I really enjoyed the online discussions. 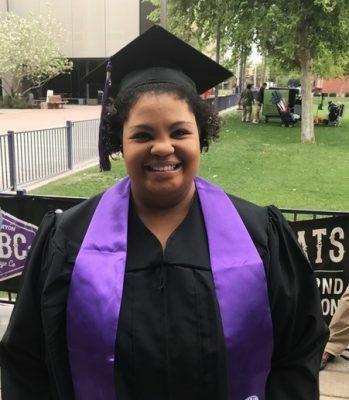 It helped me understand the reading, and made me feel connected,” said Washington, who earned her GCU degree in four years. On Friday, she joined others from her discussion groups in accepting her Bachelor of Arts in English Literature. “The bond we formed online helped all of us,” she said. For Aubrey Buckner, the trip from Fort Worth, Texas to GCU marked the final leg of an often laborious journey. Buckner set off on the road to her Bachelor of Science in Psychology degree in 2009. “In the beginning, I thought I could improve my career and earning with a management degree,” said Buckner. Buckner began colliding with roadblocks, each one larger than the last. “I’ve had trials and tribulations,” Buckner said, including a divorce that caused a heart-rending detour. She dropped her dream of graduating from college to the curb as she continued cutting, styling and coloring heads of hair. “I’m a hairdresser by trade,” she said. In 2015, she did a 360 and started on a path toward a new degree, a bachelor’s in psychology. 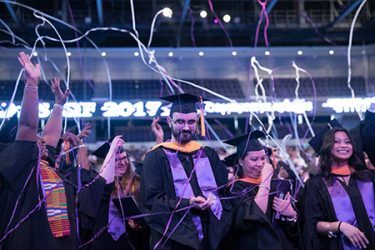 She credits two GCU advisers for smoothing the way: Zorana Tipuric, her student services counselor, and Jamie Castiglione, her university counselor-military. “Anytime I had a question, anytime I had a crisis, my advisers were there to support, encourage and motivate me, to get me back on track,” Buckner said. 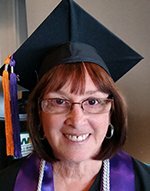 Sharon Nodine graduated from Central High School in Phoenix in 1966, and it was her goal to attend nearby Grand Canyon College. But one thing led to another, and she moved away from Arizona four years later, that dream unfulfilled. Nodine kept an eye on Grand Canyon as it grew into a university, and it was her choice when she decided to get her B.S. in Nursing. She received it on a day she called the happiest of her life. “I’m graduating from the school I always wanted to go to,” she said. Jeannette Cruz, Karen Fernau, Laurie Merrill and Rick Vacek contributed to this story. Awesome celebratory! Although I was not able to make the trip for the commencement exercise in April reading testimonies of those that finished with me was awesome. I credit all the professors and their willingness to making sure I was successful throughout the class. After thirty years I reached my goal of obtaining my Bachelor Of Science degree. Thank you God and GCU for making it happen.